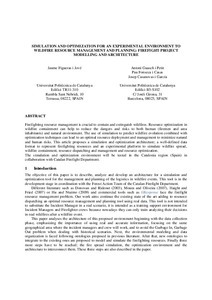 Figueras, J.; Guasch, A.; Fonseca, P.; Casanovas, J.
Firefighting resource management is crucial to contain and extinguish wildfires. Resource optimization in wildfire containment can help to reduce the dangers and risks to both human (firemen and area inhabitants) and natural environment. The use of simulation to predict wildfire evolution combined with optimization techniques can lead to an optimal resource deployment and management to minimize natural and human risks. This article proposes a simulation and optimization architecture; a well-defined data format to represent firefighting resources and an experimental platform to simulate wildfire spread, wildfire containment, resource dispatching and management and resource optimization. The simulation and optimization environment will be tested in the Catalonia region (Spain) in collaboration with Catalan Firefight Department. Firefighting resource management is crucial to contain and extinguish wildfires. Resource optimization in wildfire containment can help to reduce the dangers and risks to both human (firemen and area inhabitants) and natural environment. The use of simulation to predict wildfire evolution combined with optimization techniques can lead to an optimal resource deployment and management to minimize natural and human risks. This article proposes a simulation and optimization architecture; a well-defined data format to represent firefighting resources and an experimental platform to simulate wildfire spread, wildfire containment, resource dispatching and management and resource optimization. The simulation and optimization environment will be tested in the Catalonia region (Spain) in collaboration with Catalan Firefight Department. Figueras, J. [et al.]. Simulation and optimization for an experimental environment to wildfire resource management and planning: firefight project modelling and architecture. A: Winter Simulation Conference. "Procediings of the 2013 Winter Simulation Conference". Washington: 2013.